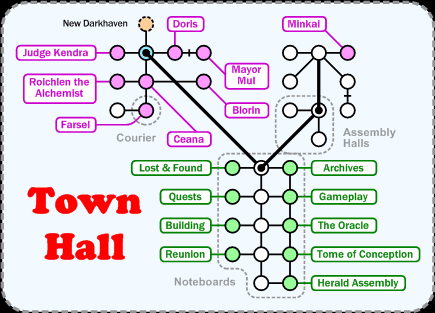 The Town Hall, possibly the only area that exists purely for administrative purposes. It's where the mortal councils meet, where the main noteboards for the game are, and has useful things like places for you to send mail and so on. Walk ( e, s ) to get from DH to the room marked in blue.